All men crave light, but off-roaders perhaps feel more of a need than others. We crave speed and adventure, and without light there won’t be much of either without great lights after the sun runs and hides. We were actually pretty impressed with the headlight performance on the 2019 Polaris RZR S four-seater. We had used it for some night driving, and we felt pretty comfortable. That was before we drove with Slasher Performance’s Slim Double Row Series LED light bar. We weren’t bashful; we went for a 30-incher. Any wider and it would interfere with the roll cage while mounting. Slasher makes the same type of bar in 6, 8, 10, 13.5, 20, 30, 44 and 50 inches. This is a straight light bar with a combo beam. It has a very white light with a clear polycarbonate lens over the LED. The black finned housing is die-cast of aluminum. The light is rated IP68 for water resistance, and the life expectancy of the lights are 50,000 hours! Because of the quality of the construction, the light has a limited lifetime warranty. We didn’t try anything fancy with the installation. Two black aluminum brackets come with the light. They have mounting hardware and a rubber pad to ride between the mounting brackets and the car. We chose to mount the light bar right to the stock roof on our 2019 Polaris RZR Turbo S. The light was literally mounted and wired in 20 minutes in the desert using ordinary hand tools and a cordless drill. We ran the heavy-duty cord down the cage frame and wired it in with a dash switch (not included). Having a light this powerful is simply amazing. Getting it aimed was very easy, and once it was, night riding had an entirely different look—a much brighter look. As high as we had the light mounted on the car, at the time it made the ground look a little flat. Another bar mounted down low would give the ground a little contour. The stock lights are great, but they get overpowered by the Slasher bar. There have been no squeaks or other protests from the mounting system, either. When you consider that this light bar retails for under $200, we could easily see adding a second bar down lower on the front of the machine. 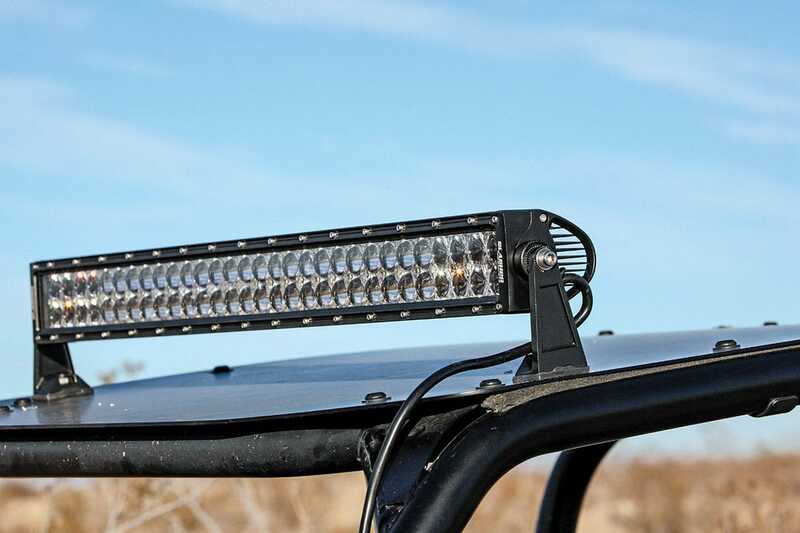 We’re very impressed with the quality and the light output of the Slasher light bar. We don’t do a lot of night driving, or at least we didn’t. We have a feeling that will change now that we can see! For more information on Slasher Performance light bars, visit www.slasherperformance.com.